We love ramen around here. And anything remotely Asian and soupy. 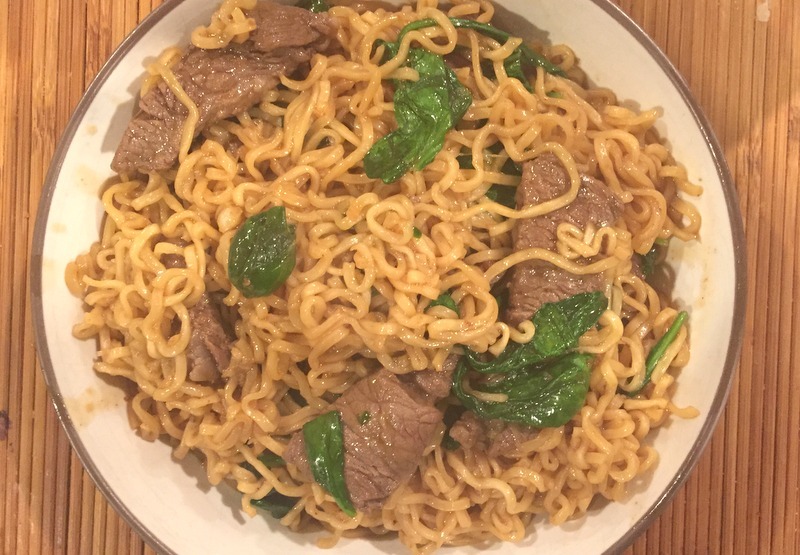 This is a beef version of our favorite pork ramen from The Best Skillet Recipes, and it is yummy. The original calls for mushrooms, but this family is less than wild about fungi. Pat the beef dry with paper towels and toss with 2 teaspoons of the soy sauce. Heat 1 tablespoon of the oil in a 12″ nonstick skillet over high heat until it’s just smoking. Add the beef, break up clumps, and then cook without stirring until it begins to brown, about 1 minute. 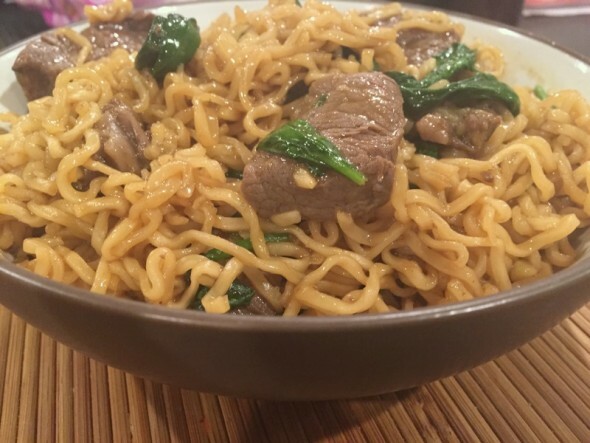 Stir the beef then continue to cook until it is nearly cooked through, 1 minute longer. Transfer the beef to a bowl, cover to keep warm, and set aside. Wipe out the skillet with a paper towel and add the remaining 1 tablespoon oil. Return the skillet to medium-high heat until shimmering. Stir in the garlic and ginger and cook until fragrant, 30 seconds. Stir in the broth. Break the ramen bricks up into small chunks and add to the skillet. Bring to a simmer and cook, tossing the ramen constantly with tongs to separate the noodles. Cook for 2 minutes, until the ramen is just tender and there is still liquid left in the pan. Stir in the remaining 2 tablespoons soy sauce, the sherry, and the sugar. Stir in the spinach, one handful at a time, until it is wilted and the sauce is thickened. Return the beef, along with any accumulated juices, to the skillet and cook until warmed through, about 30 seconds. Serve and eat.